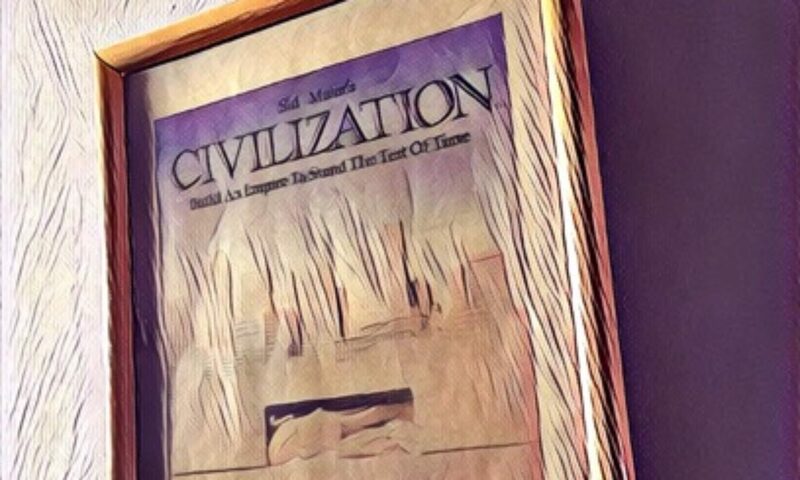 Dark Times 8 – 1993 – Obi-Wandi, a retrogaming retrographer. 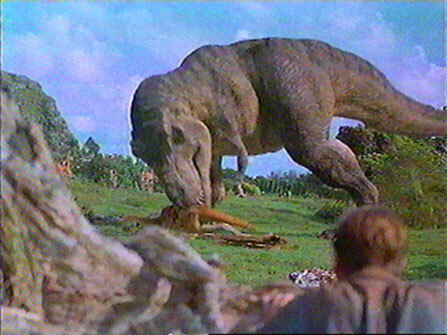 7 minutes of then groundbreaking computer generated imagery made Jurassic Park the most successful film of 1993 by far. This truly was history in the making: film posters would henceforth carry the brand-new “Visual Effects and Character Animation by Industrial Light and Magic”-label, while stop-motion wizard and inventor of the go-motion technique Phil Tippett made a memorable remark: “I think I am extinct!” Another venerable proponent of the entertainment industry did not share this pessimistic appraisal of the situation, however, as digital technology let him rediscover the fire of movie making. His name: George Lucas. At the time, Steven Spielberg worked virtually non-stop, finishing the dinosaur epic on the one hand while starting principal photography on the Academy Award-winning Schindler’s List in Europe. Scheduling issues ultimately won the better of him and Spielberg had to turn to his lifelong buddy George to handle post-production. To shoulder the responsibility for Universal’s tentpole picture of 1993 was no small feat when put in the proper historic context. Jurassic Park was the very first motion picture, one can argue, that hinged inseparably on the level of photorealism of the virtual images. Early CGI was abstract (think TRON’s light cycles) or mimicked nature in exaggerated, fantastic ways (shape-shifting liquid cyborgs, stained-glass knights and the like). Yet now audiences were required to suspend their disbelief to enjoy living, breathing animals made of bones, skin and hair. Needless to say, Lucas and Dennis Muren’s ILM team passed the test with flying colours. Another Academy Award was inevitable. Merchandise section in LucasArts’ “The Adventurer” magazine that shipped with American LucasArts releases. The fabled THX-Home Video Program sought to deliver the best possible film presentation at home. 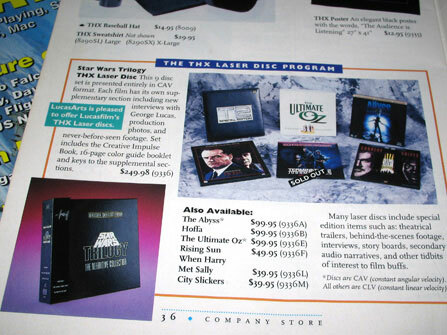 The first official Laser Disc to be officially mastered according to THX standards was the 1993 Star Wars – The Definitive Collection. Note LD siblings Rising Sun, Hoffa and the legendary T2: Special Edition. As luck would have it, the large scale assault of CGI on the motion picture industry occurred in the same year that ROTJ stuck 10 lightsabers into its birthday cake. The true icing was however neither the mammoth Star Wars – The Definitive Collection laserdisc set – the first THX certified home video release ever, nor the blockbuster Lucasarts release Rebel Assault, the legendary CD ROM game that, together with Virgin’s The 7th Guest, turned CD ROM drives into ubiquitous PC peripherals. 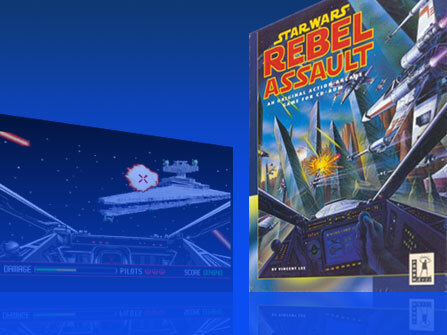 ILM footage found its way into Vince Lee’s game changing Rebel Assault: level 3 employs a blue screen element of the Millennium Falcon’s escape from Bespin. It was an inconspicuous article in the trade paper Variety. General MacLucas makes a bold landing at the entertainment industry’s beaches. 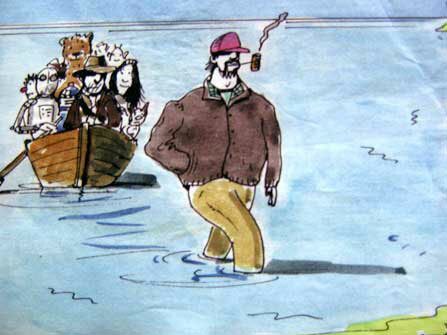 Illustration by Variety’s J.C. Suares, Variety, October 4th, 1993. 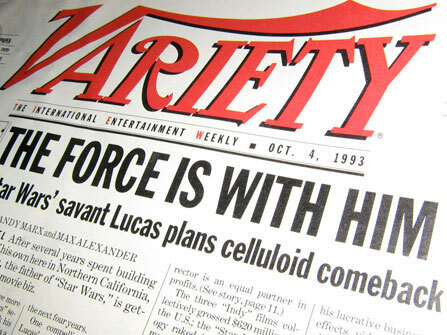 Clever media strategies, 10 years of ROTJ and an enthusiastic George Lucas: 1993 did indeed mark the return of the dinosaurs.